OK, although I have maybe 4 posts I could do, I am going to carry on with the one that (sort of) matches my earlier one. That one was about mixing up Pearl-ex (or other mica powders) with acrylic medium and using it like a paint on the Gelli Plate to create a sheer glimmer effect. I feel like I have only scratched the surface of this, but I have so much to share! THIS one is what I mentioned, and that is mixing the medium with ultra-fine glitter to use like paint. Now, for this sample I did mix in a small amount of mica powder as well, although a daub of paint would work too, just to give the medium some colour. Proportions? Well I suspect it will very much depend on the product you have. I used about a heaped teaspoon of medium (I added more after I took the photo) maybe 1/8th tsp mica powder (and this was cheap, inferior powder so very little colour transferred) and maybe 1/4 tsp Maya Road ultra-fine glitter. You really do NOT want to use chunky or glass glitter for this – I’m pretty sure that will tear up your plate! 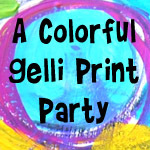 Mix it up to a smooth paste and brayer it on your Gelli plate. Now, I tend to use this technique as a final pull on top of a plain paint one so use it thru a stencil. Experiment. Maybe layering this mixture over another paint layer might work. You can get a pretty thick coating and it will still be pretty sheer, even with the small bit of mica. I did a pull on plain white paper, because I think it demonstrates it a bit better. AND, like yesterday, if you scrap up all the excess with a palette knife or catalyst tool you can force it thru the stencil to create a thick glitter layer. less sheer but still textured and cool.This photo was taken while it was still wet, but as it dried it got slightly more sheer. One thing worth warning about – the medium is a little … sticky, I guess. Press firmly on the paper to transfer as much as you can, but don’t be surprised if there is a def ghost left that you can’t get off. Clean your plate, Also, don’t leave the paper on there for too long – instead of pulling the medium onto the paper, the paper can stick to the medium and thus to the PLATE, which is a pain. I do think this is a fun one, but once again, be careful about what you are mixing in. Nothing so gritty it will damage the surface of your plate. Ultra-fine glitter is what I used. Not sure if kid’s quality glitter is going work but you could maybe mix up a tiny bit then sort of rub it between your fingers and check the grit. If it feels sharp, even sharp-ISH in any way, I wouldn’t use it, or limit myself to a tiny corner of the plate just to see. The ugly samples from yesterday? They involved pulling the print then daubing on Distress Stain. It does NOT dull the sparkle of the glitter so def. something to look at again. 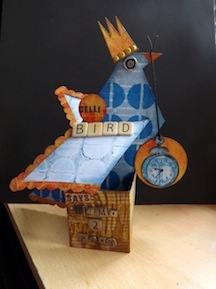 AND I am already wondering about a glittery pull on contact paper…..but that will have to be a play for another day. I have to finish the project then I can share the CD I mentioned earlier. But probably not today! 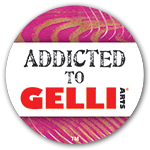 Categories: art, Gelli plate monoprints, tutorial | Tags: art techniques, GelliPlate, glitter, how-to, Mica | Permalink. While the power as out the sun wasn’t shining, so apologies if some of the photos are a bit dark. I had a good long experimental play session today. I had some ideas I wanted to try, the first being additives to the acrylic medium. I did that first on the fish (the one I pointed out as having “something going on” that you couldn’t really see) where I used silver metallic paint . While it worked well, giving a sheer soft glow, I was sure that gold would work better and that Pearl-Ex (or perfect Pearls or some other mica powder) would be better. It was. None of the photos will really capture the sheer-ness of the shimmer, not like I see it IRL, but maybe they will give you enough of an idea for you to have a bash. The first thing I did was to mix up the acrylic medium with the Pearl-Ex. I wanted a nice smooth paste, the consistency of paint, and I wanted the mica powder to be just a bit, so when the medium dried the sheer quality wouldn’t be lost. Now, you can see I tried a few things over it, a bit like the GA video where they daub on Distress Stain and the medium acts as a resist. The issue is the stain, ink sprays, and mica sprays all dull the shine of the powder at least a bit. In that sense, the metallic PAINT mixed with the medium is maybe a bit better. It does still have a subtle glow to it, but you can’t really see it here. With the little smidge left, scraped together, I could do a dimensional effect through sequin waste! You can see it there above at the far left. And it’s really nice when layered over standard pulls. I had also experimented with pulling a print on the shiny side of an old CD. The CD grabbed a fair bit of the paint from the plate, but there was a fair bit left so I pulled that on paper. You can clearly see the impression of the CD here. And the CD itself is way cool – as is adding superfine glitter to the Acrylic medium, although the samples were done using a really rubbish stencil. While you can see that it works the samples are just not all that attractive. Neither are some of these, to be fair, but I like the glittered effect well enough that I’d like to showcase it better. This may end up being a multi-post day LOL! I have a couple more things I played with that I feel might need some further experimentation and/or refining before I share. I want to play enough that I can offer some guidelines for how to get the effects I got. But oh I DID have fun….. Categories: art, Gelli plate monoprints, tutorial | Tags: Acrylic paint, art techniques, Distress Stain, Gelli plate, how-to | Permalink.